Heroes, Heroines, and History: "Extraordinary Escape of an American Traveller!" "Extraordinary Escape of an American Traveller!" This is a true account, taken straight from the pages of an 1819 Ackermann's Repository (A popular magazine in England at the time.) I thought it was exciting to read, and better as told by the survivor than by myself. For your convenience, after reading the abridged version here, you can instantly download the entire story from this link. 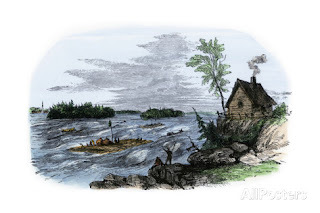 "On the 22nd day of April, our party set sail in a large schooner from Fort George, or Niagara-Town, and in two days crossed Lake Ontario to Kingston at the head of the river St. Lawrence, distant from Niagara about 200 miles. Here we hired an American barge (a large flat-bottomed boat), to carry us to Montreal, a further distance of 200 miles; then set out from Kingston on the 28th of April, and arrived the same evening at Ogdensburgh, a distance of 75 miles." "On the 30th of April, we arrived at the village of Cedars, immediately below which are three sets of very dangerous rapids (the Cedars, the Split-rock, and the Cascades), distant from each other about one mile. On the morning of the 1st of May, we set out from the Cedars, the barge very deep and very leaky. The captain, a daring rash man, refused to take a pilot." "After we passed the Cedars rapid, not without danger, the captain called for some rum, swearing at the same time, that God Almighty could not steer the barge better than he did! 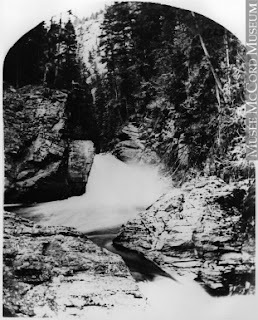 Soon after this, we entered the Split-rock rapids by a wrong channel, and found ourselves advancing rapidly towards a dreadful watery precipice, down which we went." The barge slightly grazed her bottom against the rock, and the fall was so great as to nearly take away the breath. We here took in a great deal of water, which was mostly baled out again before we hurried on to what the Canadians call the Grand Bouillon, or great boiling. "The barge was almost immediately overwhelmed in the midst of immense, foaming breakers, which rushed over the bows, carrying away planks, oars, &c. About half a minute elapsed between the filling and going down of the barge during which I had sufficient presence of mind to strip off my three coats, and was loosening my suspenders when the barge sunk, and I found myself floating in the midst of people, baggage &c."
"Each man caught hold of something; one of the crew caught hold of me, and kept me down under water, but, contrary to my expectation, he let me go again. On rising to the surface, I got hold of a trunk, on which two other men were then holding. Just at this spot, where the Split-rock rapids terminate, the bank of the river is well inhabited; and we could see the women on the shore, running about much agitated." "A canoe put off and picked up three of our number, who had gathered at the bottom of the barge, which had upset and got rid of its cargo; these they landed on an island. The canoe put off again, and was approaching near to where I was holding on the trunk, when, terrified with the vicinity of the cascades, to which we were approaching, it put back, notwithstanding exhortations in French and English, to induce the two men on board to advance." The bad hold which one man had of the trunk to which we were adhering, subjected him to constant immersion, and in order to escape his seizing hold of me, I let go the trunk, and, in conjunction with another man got hold of the boom, ...and floated off. I had just time to grasp this boom when we were hurried into the Cascades; in these was instantly buried and near suffocated." On rising to the surface, ...I perceived the barge, bottom upwards, floating near me. I succeeded in getting to it, and held by a crack in one end of it: The violence of the water and the falling out of the casks of ashes, had quite wrecked it. For a long time, I contented myself with this hold, not daring to endeavour to get upon the bottom, which I at length effected; and from this my new situation, I called out to my companion, who still preserved his hold of the gaff." "He shook his head, and when the waves suffered me to look up again, he was gone." ..."For two miles below, the channel continues in uproar, just like a storm at sea, and I was frequently nearly washed off the barge by the waves which rolled over. I now entertained no hope whatever of escaping; and although I continued to exert myself to hold on, such was the state to which I was reduced by cold, that I wished only for speedy death, and frequently thought of giving up the contest as useless." "I had never descended the St. Lawrence before, but I knew there were more rapids ahead, perhaps another set off the Cascades; but at all events the La Chine rapids, whose situation I did not exactly know, I was in hourly expectation of these putting an end to me, and often fancied some points of ice extending from the shore to be the head of foaming rapids." ..."I was now going, with wind and current, to destruction; and cold, hungry, and fatigued, was obliged again to sit down in the water to rest, when an extraordinary circumstance greatly relieved me. On examining the wreck, to see if it was possible to detach any part of it to steer by, I perceived something loose, entangled in a fork of the wreck, and so carried along. This I found to be a small trunk, bottom upwards, which, with some difficulty, I dragged up upon the barge. After nearly an hour’s work, in which I broke my penknife trying to cut out the lock, I made a hole in the top, and to my great satisfaction, drew out a bottle of rum, a cold tongue, some cheese, and a bag full of bread, cakes, &c. all wet." "Of these I made a seasonable though very moderate use, and the trunk answered the purpose of a chair to sit upon, elevated above the surface of the water. " 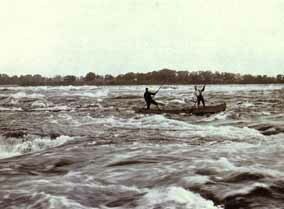 ..."The velocity with which I was going, convinced me of my near approach to the dreadful rapids of La Chine. Night was drawing on, my destruction appeared certain, but did not disturb me very much: the idea of death had lost its novelty, and become quite familiar." ..."At last I perceived a boat rowing towards me, which being very small and white-bottomed, I had for some time taken for a fowl with a white breast; and I was taken off the barge by Captain Johnstone, after being ten hours on the water." "I found myself at the village of La Chine, 21 miles below where the accident happened, and having been driven by the winding of the current a much greater distance. I received no other injury than bruised knees and breast, with a slight cold: the accident took some hold of my imagination, and for seven or eight succeeding nights, in my dreams I was engaged in the dangers of the Cascades, and surrounded by drowning men." 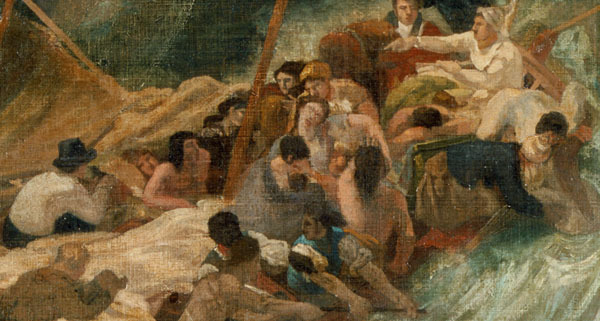 ..."When the people on shore saw our boat take the wrong channel, they predicted our destruction: the floating baggage, by supporting us for a time, enabled them to make an exertion to save us; but as it was not supposed possible to survive the passage of the Cascades, no further exertions were thought of, nor indeed could they well have been made." ..."I think my knowing how to swim kept me more collected, and rendered me more willing to part with one article of support to gain a better: those who could not swim, naturally clung to whatever hold they first got, and of course many had very bad ones. 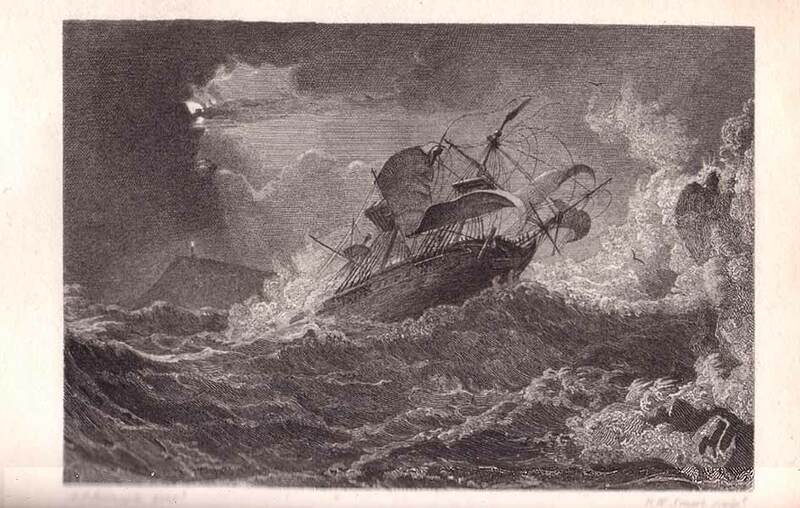 The captain passed me above the Cascades, on a sack of woolen clothes, which were doubtless soon saturated and sunk." While you're at it, why not also download my free PDF of fun and pretty Autumn printouts? You'll want a color printer to make the most of this, or have fun coloring the illustrations! 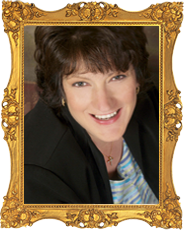 Linore Rose Burkard is best known for her Inspirational Regency Romance Series, where authenticity and heart-warming adventure are par for the course. Fans of romance in the tradition of Austen and Heyer (such as Pride & Prejudice, Cotillion, and even My Fair Lady), enjoy meeting Linore's feisty heroines and dashing heroes. As L.R.Burkard, Linore now writes YA/Suspense. PULSE, a suspenseful apocalyptic cautionary tale, is available on Amazon. That sure is a harrowing story. It's amazing anyone survived. Thanks for sharing it. WOW! What an incredible event ... and to survive! Thanks for sharing that. I was imagining myself a woman dressed in 19th century costume with all those yards of wet clothing and unable to swim ... and it made me shudder to think of it. The arrogance of that captain made me think of the saying "pride goeth before a fall." Thanks for sharing an amazing story, Linore. Very interesting story. Amazing how one survived. What an interesting story! Thanks for sharing it. Amazing that he survived. Incredible story - no wonder they built the locks of the St. Lawrence Seaway! Thanks, ladies. Stephanie, you're right about all that clothing! Definitely wouldn't have increased one's odds of survival.